"Cold salad is made with corn and peppers. You will be proud to take with you for any holiday occasion!" 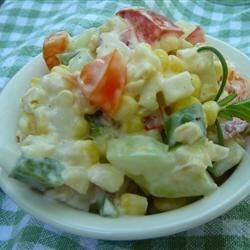 In a large bowl, mix together the corn, yellow pepper, red pepper, green pepper, red onion, cucumber, tomato and mayonnaise. Adjust the amount of mayonnaise to your liking. Chill until serving. A pretty salad. I used less mayo because I don't like mayo much. I also added some spices/fresh herbs. Bright colors and easy to make. Thanks for sharing. We thought this was bland. I love this salad! I top mine with a small bag of chili fritos crunched up. Try it, its excellent. I made this for a casual picninc/barbque and everyone did the full-mouth head nod and continued eating. Usually I get some yes and some no but this was an all around pretty good. Easy to make and tastes great. I added fresh basil from garden and used cherry tomatos. I think it tasted even better. I really wanted to try this but we don't eat mayo so I substituted fat free sour cream and caesar salad dressing, I didn't measure just added enough to the vegetables, my family really liked it.